The Ebola outbreak in West Africa is the deadliest epidemic since the virus was discovered in 1976, crossing international borders, it has claimed over 2’600 lives (as of September 18, 2014). There is no vaccine and there is no cure. Aid and medical personnel are sought from all over the world, borders have been contained, and risks of rising violent conflict continue to develop out of the Ebola eruption. However, there have been other interesting analyses of this issue on the side – media and opinion pieces are claiming that terrorist groups could get a hold of the virus and spread it around their regions, and the world (see for example Rick Noack, “Why Ebola worries the Defense Department“, The Washington Post, 05.08.2014). Well, I wanted to test this claim for myself, so with a bit of research and optimism, I’ve created a recipe to examine what a potential terrorist group would need to do to make this so-called “Ebola Bomb” – how hard could it really be? Many studies from a health, as well as a humanities perspective, assume that terrorists could successfully generate biological or chemical agents and weaponise them. Taking this initial premise, a lot of literature has been based around this looming threat, subsequently offering policy advice, public health recommendations, and technological investment to avoid such catastrophes. However it would be useful to deconstruct this claim entirely. So I’ll begin by offering a baking recipe, to explore at the very core, what a group would need to do to successfully create a biological weapon, in this case, utilising the Ebola virus. Firstly, any terrorist group wanting to create and weaponise a biological or chemical agent will need to have an appropriate kitchen. In the case of the Ebola virus, a standard biosafety level 4 (BSL-4) scene will be required (Adeline M. Nyamathi et al., “Ebola Virus: Immune Mechanisms of Protection and Vaccine Development“, Biological Research For Nursing 4, No. 4, April 2003: 276-281). Some features of these laboratories include decontamination mechanisms, pest management systems, air filters, and special suits. Sometimes the kitchen will have to be in a separate building, or in an isolated area within a building to meet the safety requirements. Not only will the kitchen be under strict conditions, the baking process will need to be kept in total secrecy. The constant threat of law enforcements raiding facilities, and intelligence and secret services detecting activities will have to be avoided. Also, there are only some fifty of these laboratories successfully maintained worldwide. Initially, a terrorist group must decide what kind of agent they would like to use in a bioterror attack. This is one part of the recipe which can be modified, but the other ingredients will be standard for all types of attacks. The recent spread of the deadly Ebola virus will be the agent of choice for this bomb. Ebola is a virus which is passed to humans through contact with infected animals. The spread of the virus from person-to-person is brought about through blood and bodily fluids, as well as exposure to a contaminated environment. An infected live host with Ebola would need to be maintained in a human or animal – only a few animals are able to be used as hosts, such as primates, bats, and forest antelope. Although Ebola infection of animals through aerosol particles can be effective, it has not successfully been transferred with this method to humans (Manoj Karwa, Brian Currie and Vladimir Kvetan, “Bioterrorism: Preparing for the impossible or the improbable“, Critical Care Medicine 33, No. 1, January 2005: 75-95). 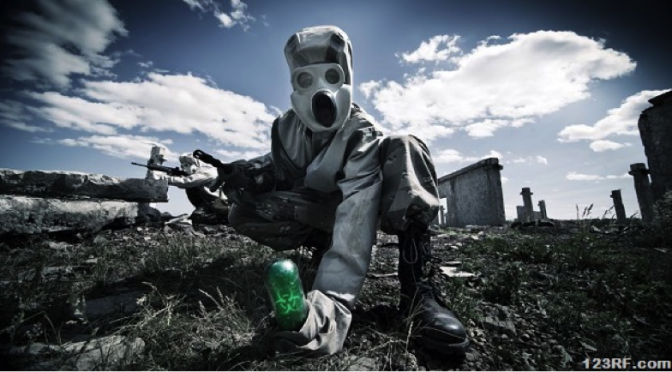 In order to develop a biological weapon, a substantial amount of material and money is required. Investment is needed from the very outset – taking into account membership size and capabilities of a terrorist group, financial assets of a group, and making sure territory and proper infrastructure is available for the biological agent. For a successful bomb to be created, a group must think about the resources they will need for each stage of the baking process, such as weapons production, potential testing phases, and logistics, such as transportation and communications technologies (Victor H. Asal, Gary A. Ackerman and R. Karl Rethemeyer, “Connections Can Be Toxic: Terrorist Organizational Factors and the Pursuit of CBRN Terrorism“, National Consortium for the Study of Terrorism and Responses to Terrorism, 2006). Resources needed for an “Ebola Bomb” will most likely need to be imported from the outside, and a group must determine the feasibility of acquiring the materials and technologies needed for the bomb (Jean Pascal Zanders, “Assessing the risk of chemical and biological weapons proliferation to terrorists“, The Nonproliferation Review, Fall 1999: 17-34). A surplus of money would also be a smart idea in case technical difficulties arise. Health and Security“, Global Policy Essay, May 2013). If Ebola is successfully created in the kitchen, it is not itself a biological weapon – an expert will be required to transform the virus into a workable mechanism for dissemination. The decision to use biological weapons for an attack is in itself extremely risky. There is a risk that bioterrorism could cause dissenting views among followers, and that public approval and opinion may channel the way a group operates. After all, terrorists are political communicators, wanting to bring attention to their grievances. If a group becomes polarised or resented by their actions, they will not see the benefits of pursuing certain methods. Terrorists want to send powerful messages, gain more members, in which these members assist to bring about certain plans and demands. Therefore, public opinion and political opportunism will be risked in a quest to create a bioweapon such as an “Ebola Bomb” (Zanders). Secondly, a terrorist group may be subject to more scrutiny or attention. This is why keeping activities covert will be a key to success. States will be more vigilant towards groups that are known to be seeking and acquiring biological and chemical capabilities (Asal, Ackerman and Rethemeyer). And finally, risk will always cling on to funding requirements, and potential technical difficulties in all stages of the bioweapon making process. Now this recipe is going to take a while to prepare and bake in the oven, and there is no particular moment to determine when it should be removed from the baking dish. So, whatever group wants to make this bomb, will need to realise this is a long-term and complex effort. It will not work like most conventional weapons, which produce a high number of casualties with a single explosion, and that could be a reason why bioterrorism is not the most popular means for a violent attack – demanding time, effort, and resources without guarantees of a concrete result. A fist full of time may be needed so that knowledge, both tacit and explicit, can be acquired, as well as accounting for the various mistakes and learning curves to overcome (Asal, Ackerman and Rethemeyer). It can also refer to how long it will take to cook up, maintain and prepare a virus for an attack. It will take time to create a successful weapon with prior testing, and wait for the correct environmental conditions when it comes to dissemination. Time will have to be a group investment – it is not the kind of bomb that will detonate immediately. The teaspoon of risk coincides with uncertainty, and there will need to be a commitment to potential unknown factors. It is unknown what will happen once a virus is disseminated. Will the weapon even work in the first place? Weather conditions are unpredictable and Ebola will not have a prominent effect in certain environments. What happens to the terrorist group if the attack fails? What happens to the reputation of the group and its membership, or will the group cease to exist? If the recipe is a success, it is impossible to control the biological agent which is released – not only can it affect the targeted population, but it may annihilate the terrorist group itself. There will be an unknown into potentially losing local and international support, and donors if this causes widespread catastrophe. 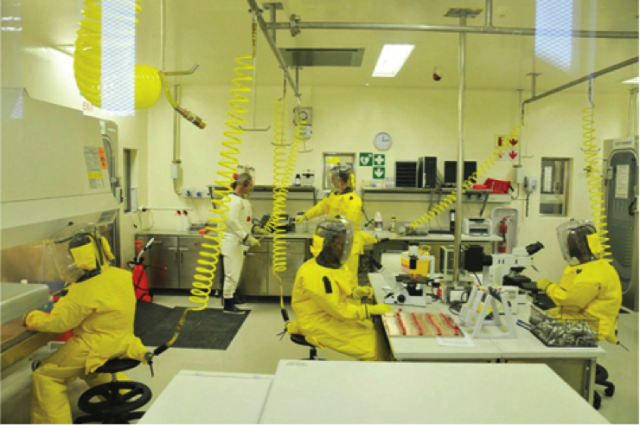 Scientists from the Southern African Development Community region, including a sponsored postdoctoral research fellow by the Southern African Centre for Infectious Disease Surveillance, working in the only biosafety level 4 (BSL-4) laboratory in Africa, which is located at the National Institute for Communicable Diseases, Johannesburg, South Africa. Mix that up good in your baking dish of what is now “deep uncertainty” and pop it in the oven to bake. But as time passes, it seems as though the ingredients are not rising. The process of turning a biological agent into a weapon for attack is the phase with the most hurdles for terrorist groups. In order for a virus to inflict a lot of harm, it has to be disseminated through an effective delivery mechanism. As mentioned previously, the Ebola virus needs a live host. Weaponising a live host is more difficult than other agents which can be cultured on dishes of nutrients. The process has many stages which involve testing, refining, upgrading, and toughening. The methods to disseminate an agent are only known to few people, and rarely published – it is not a basement project (Teckman). Let’s take Aum Shinrikyo as an example of conducting a bioterrorist attack (even it was “only” a chemical attack). This apocalyptic religious organisation in Japan managed to release sarin gas inside a Tokyo subway, killing a dozen people, and injuring 50. However, even with money and resources, they failed to effectively weaponise the chemical. Factors which led to their failure included internal secrecy and breakdown in communication; selecting members only solely dedicated to their cause to work on the weapons, ultimately employing unskilled people to operate and maintain the project, causing accidents and leaks (Zanders). Aum Shinrikyo’s attempt to disseminate botulinum toxin into Tokyo using a truck with a compressor and vents, did not work because they had not acquired an infectious strain (Sharon Begley, “Unmasking Bioterror“, Newsweek, 13.03.2010; “Chronology of Aum Shinrikyo’s CBW Activities“, Monterey Institute of International Studies, 2001). Finally, a major obstacle to successfully disseminating Ebola, is because this virus requires a specific environment in order to thrive. Weather conditions can be unpredictable, and Ebola particularly needs high temperatures and humidity to remain effective. 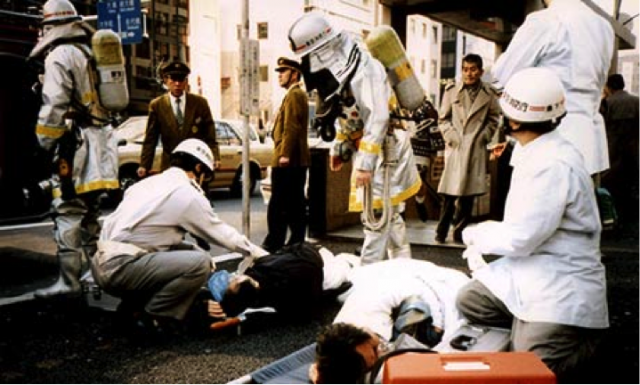 The emergency service tend to victims of the Aum Shinrikyo sarin attack on Tokyo’s subway in 1995 (Photo: Rex Features). Obviously, this “Ebola Bomb” has not come close to containing the right requirements needed to explode. Looking back historically, pathogens, and all kinds of toxins have been used as tools in sabotage and assassinations since the beginning of time. Now, it would be silly to say this recipe will never work – there will always be a possibility that Ebola or other viruses may be used as biological weapons in the future. However, the likelihood of its development and use by a terrorist group is quite improbable. Mentioning Aum Shinrikyo again, they are an organisation which at the time, had a war chest of more than $300 million, with six laboratories and a handful of biologists, in the end having insurmountable difficulties with the weaponisation and dissemination processes, and killing a dozen people (Begley). There is a greater amount of knowledge and technology available in our day and age than in 1995 with the Aum Shinrikyo attacks, but it is still unlikely that this will be the weapon of choice. Examining state biological weapons programmes, Soviet Russia had almost 60,000 personnel employed in their weapons development, with only about 100 people that actually knew how to take an agent through the full production process. In the United States, at Fort Detrick, there were 250 buildings with 3,000 personnel, and it took them a while to weaponise a single agent, such as botulinum (Manoj Karwa, Brian Currie and Vladimir Kvetan). Diversion of resources from public health in the United States include diversion of funds needed for protection against other chemical risks – spills, leaks and explosives – and infectious diseases. Each year in the United States there are 60,000 chemical spills, leaks and explosions, of which 8,000 are classified as ‘serious’, with over 300 deaths. There are 76 million episodes of food-borne illness, leading to 325,000 hospitalisations and 5,000 deaths, most of which could be prevented. There are 110,000 hospitalisations and 20,000 deaths from influenza, a largely preventable illness, and there are 40,000 new cases and 10,000 deaths from HIV/AIDS. Diversion of resources for public health outside the US reduce the resources that can help provide protection against diseases rooted in poverty, ignorance and absence of services. — Victor W Sidel, “Bioterrorism in the United States: A balanced assessment of risk and response“, Medicine, Conflict and Survival 19, No. 4, 2003: 318-325. The effectiveness of biological weapons has never been clearly shown, the numbers of casualties have been small and it is likely that hoaxes and false alarms in the future will continue to outnumber real events and create disruptive hysteria (Manoj Karwa, Brian Currie and Vladimir Kvetan). Emphasis needs to be back on medical research, as well as social science investigations into the roots of why terrorist groups would even want to pursue biological weapons, and the lengths they would go to use them. Let this be an avenue for further pondering and exploring, the realities of bioterrorism. Sandra Ivanov is from New Zealand with a postgraduate education in Peace and Conflict Studies. She is currently an editor of the blog “Conflict and Security“, and primarily works in the non-government sector. You can find her through Linkedin or follow her updates on Twitter. This article was first published last Sunday on CIMSEC’s partner site offiziere.ch. In the mean time, we answered some comments, which mostly could be found on Facebook. Here, we will share our answers with you. Some people wrote that only an infected dead body or an infected “suicide bomber” would be necessary to spread the virus. These “suicide bombers” could board planes and actively infect as many people as they can during the flight. Actually, this is easier said than done. How would someone smuggle infected dead bodies from these countries to a designated target country without getting noticed? At least for the US, Canada and European countries, this is very unlikely. Bodies are infectious as long as their blood and secretions contain the virus. Because of the decomposition process this is a matter of days and not weeks, even the body is cooled. It may be easier only to smuggle infected blood, but even the blood has arrived the designated target country, the problem of a mass distribution is an additional high barrier. Regarding to “suicide bombers”: Passengers from these countries are screened before and during the flight and when they show typical symptoms at the destination airport (see also http://www.cdc.gov/vhf/ebola/outbreaks/guinea/qa.html). According to the WHO, the incubation period, that is, the time interval from infection with the virus to the onset of symptoms is 2 to 21 days. Humans are not infectious until they develop symptoms. The first symptoms are the sudden onset of fever fatigue, muscle pain, headache and sore throat. This is followed by vomiting, diarrhoea, rash, symptoms of impaired kidney and liver function, and in some cases, both internal and external bleeding (e.g. oozing from the gums, blood in the stools; WHO, “Ebola virus disease“, Fact sheet No. 103, September 2014). In other words: to infect a plane during the flight, the symptoms are already detectable. And even then, the Centers for Disease Control and Prevention writes that “[w]hile possible, it is unlikely that an infected person who traveled from an area with Ebola to the United States on an airline would spread the disease to fellow passengers.” Forget all Hollywood blockbusters! Again, if someone infected manages to reach the designated target country, there is still the problem of mass distribution regarding the deterioration of the health condition of the “suicide bomber” (the bleeding phase starts 5-7 days after the first symptoms; cf. : D.I.H. Simpson, “Marburg and Ebola virus infections: A guide for their diagnosis, management and control“, WHO Offset Publication No. 36, 1977). Sure, it’s not impossible, but very unlikely that a “suicide bomber” will chose a such risky method, when he can achieve his goals (killing a lot of people and send a message to the public) with conventional means. In addition, ISIS showed us that a reporter and a knife is enough to terrorize the public perception through social media. There are additional operational constraints for a terror organization to use such method, which are named in the article. The lack of such attacks and the failed attempts of Aum Shinrikyo respectively al-Qaida is a sign, that this is not a “promising” strategy for terror organizations. Last but not least, one Facebook comment was: “Step 1 – Watch Breaking Bad; Step 2 – Think again”. Learning through fiction – a promising intellectual development, isn’t it?